My shop is in the process of moving from Pittsburgh, PA to Anchorage, AK. I am set up in Anchorage and can take new jobs, but I am limited to letter size printing and do not have all colors available. Somewhere between offset printing and a photocopier, Risograph(Riso) printing has been used in offices to do large print runs of one or two color documents, or in church basements and by groups like the Boy Scouts to print newsletters. My shop operates GR models. These are pretty old machines, but they produce really cool results and can print in a bunch of different colors. I can currently print accurate registration(for a Riso) on letter sized paper. I am in the process of refurbishing a machine that will be able to print tabloid. If silkscreen and a photocopier had a baby that baby would be a Riso. Riso printing functions like a photocopier, but instead of burning toner to a sheet of paper, the machine burns your image into a sheet of material called a master and stretches it around a cylindrical screen called a drum. Paper moves through the machine at high speeds, passing under the drum(see gif below). A squeegee/roller system on the inside of the drum pushes the ink through the screen and master, which operates like a stencil. The result is that whatever was black on your original design prints in whatever color of soy-based ink is in the drum. 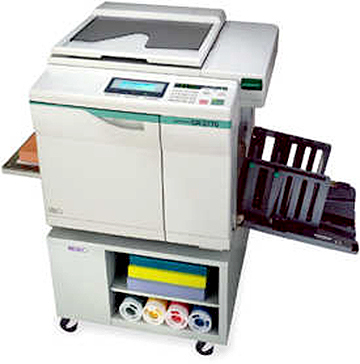 To print multiple colors the paper has to go through the machine multiple times. A Riso is able to print on a variety of uncoated paper sizes and stocks, but there are limitations. Risos cannot print full bleed and require a 3/8" border on each side. They will then be cut to the project's finished size after it dries. Because the oil based ink dries through absorption, Risos cannot print on coated or glossy paper. GR models cannot print on heavy card stock either. French Paper Co. is a wonderful producer of paper and has many styles, colors and stocks of paper that work great. For projects, you should provide both print files and a low-res color composite to use as a guide. Print files should be pre-separated grayscale pdfs (one for each color - with color in the filename. Ex. "your-name_project-title_blk.pdf), formatted in normal reading order (front cover, inside cover, page 1, page 2, etc.) as pages not spreads. If the project is full bleed, include at least 1/8" bleed area but no additional crop marks and margins. Remember to make important details like text and outlines pure black (#000000), but avoid large patches of pure color because the Risograph does not deal well with areas like these. Please be in touch with questions about preparing your work. I also offer design help and can work with you on making sure you prepare your files correctly for an additional hourly fee. I have 11 colors of ink to choose from, including black, red, burgundy, orange, yellow, federal blue, green, teal, purple, fluorescent pink, and flat gold. Riso inks are soy-based and semi transparent. This means that they mix when overlapped and that the color of paper used effects the appearance of the color of the ink after printing. Federal blue looks almost black on mid-tone papers and pink looks orange on yellow paper for example. Is Riso Right For Your Job? There are a few things you should consider before choosing Riso for your job. Riso is not hi-res, high-definition or archival. It does not produce perfect results. Your finished job will look different from what’s on your computer screen. An edition of 25 prints is the absolute minimum. Registration on a Riso is never perfect. And each impression will not be consistent. Plan for mis-registration, it is part of the process' appeal. A multi-color image is created by switching one ink drum for another and then feeding the same paper back through the machine again. Since the inks are still wet when coming out of the machine, time must be set aside for drying between colors. Even with adequate dry time, it is common in multi layer prints to experience roller marks along the leading edge. Especially on prints with large, heavily saturated areas of color. These can be erased easily with a soft white eraser. There are a lot of factors involved in pricing a job, so the best way to get an accurate estimate for a price is to fill out the quote form below. That said, the following price breakdown will give you an idea of how I reach my prices for most basic jobs printed at letter size. For example printing 100 copies of a 1 page, 2 color design would cost $11.00 ($50.00 start up fee) + $20.00(2 masters @ $10) + $40(200copies(100 x 2 colors) x $0.20). 200 copies of the same job would cost $150.00, as it would not involve making any more masters. I offer Riso printing as well as some design, binding and finishing services. Please include as much detail about your job as possible. How accurate the printing of each color needs to be. For best registration keep the print area limited to 7.75x10.25". Print Area: Right now the largest area I can print is 7.75x 10.25". Sheets of paper can be bigger, leaving a margin of unprinted space around your design.